You can view the information on sent claims. Then, as needed, you can make changes and either resubmit or reprint the claim, split the claim, or delete the claim. On the Sent Claims page, all sent claims, including rejected claims, appear in the list. Click (or tap) a claim with a Sent status. On a patient's Insurance Claims page, click (or tap) a claim. 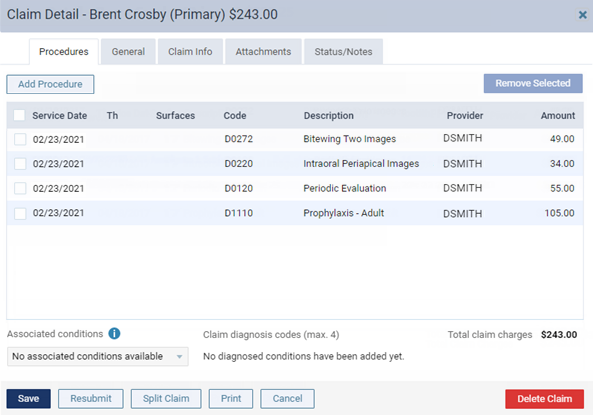 On a patient's Ledger page, click (or tap) a claim. To delete the claim, click (or tap) Delete Claim. To resubmit the claim, click (or tap) Resubmit (not available for claims with a Queued status). To print the claim, click (or tap) Print. To split the claim, click (or tap) Split Claim. This button is available only if the claim is a primary claim, has not been paid, and has at least two procedures attached. Also, if the PPO write-offs setting is turned on, and write-offs have been posted for the claim, you must delete the write-offs before the Split Claim button will become available. Why are the NEA #'s that are attached to claim not being seen by Ins. Co.? What does it mean when a claim has a status of "NEA HOLD"?